I recently guest posted over on Maria’s Farm Country Kitchen about how to green your wrapping paper options. Why? With Over 4 million tons of wrapping paper and shopping bags used during the holidays along with ribbons, bows, tissue paper, and cardboard box, I wasn’t surprised to learn Americans throw away 25% more trash from Thanksgiving to Christmas. I listed numerous options from the a simple ribbon around a white box to making your own gift wraps. But in order to keep the article concise, I decided to break the article up into two parts: greener wrapping paper options on Maria’s Farm Country Kitchen blog and all the rest of your gift wrapping trimming here from bows to greeting cards. You all must be thinking there is no way she wrote a short article for Maria. Brevity is not Anna’s strong suit. Oh by the way, know it alls, I still have plenty to say for this green bows to greeting cards article. I don’t want you to feel deprived. 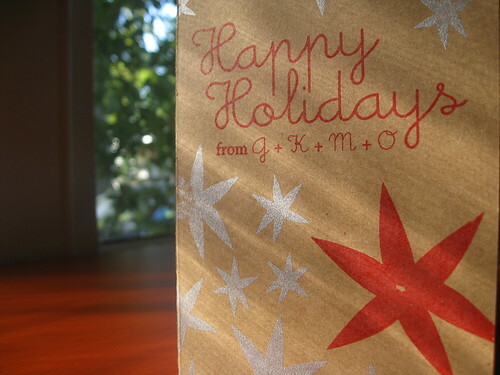 Send post-consumer recycled content holiday greeting cards. Conservatree.com has a long list of vendors to choose from. Send greeting cards online from such online venues as Hallmark, American Greetings, and others. Like sending the greeting cards with pictures? Consider sending them through Pingg and Paperless Post. Consider buying ReGreet cards where your recipients can resend your card to someone else. Make your own cards from making paper. Great family project. Reuse them for next year. Just strike out your name and insert your friend’s name! Cut them up and use the cards as gift tags for the next year. Send them to St Jude’s Ranch for Children so that the cards can be used to create new cards. This program helps the children learn entrepreneurial skills. You can purchase the new cards online. Note, you can send cards all year round. Use the cards for scrapbooking and children’s art projects. With every gift comes a gift tag. Here are some more greener options to show off your holiday gifts. Um, last year’s gift cards! Although it might be too late for this year, consider saving ribbons from all the other gifts you receive during the year. Then you have a whole pile of used ribbons. Make your own bows out of old magazines. This project is great to share with your kids. Make your bows out of chips bags. I absolutely love this idea! Buy an up-cycled bow made out of sheet music. Use Hemp twine, recycled paper ribbon, or Raffia fiber to give your gifts that Earthly look. Consider wrapping your gifts without tapes. Don’t use wrapping paper and simply tie any of the Ribbon suggestions above around a plan white box. If you do get a wrapped gift, take off the tape and then recycle (if you can) or reuse the paper. By the way, wrapping paper makes great backdrops to framed pictures. Thrift shops have a wonderful assortment of pans, trays, glasses, and ceramic bowls. Use old plates and ceramic bowls as gift holders full of goodies. Keep old cardboard boxes from this year’s gifts. Reuse them next year. Don’t forget to green your tissue paper as well. Consider seeded tissue paper from companies such as Little Kay Garden. Now, not to brag, but the above are some pretty creative suggestions. But I also pride myself for having some of the most creative readers. So, spill on how you green your gift wrapping options with all the frills. Upload pictures or videos to Green Talk’s Facebook Fan Page or to the Forum. Photo by Kim Love of The Lovelihood. These are awesome ideas for Christmas gifts. I think I know a technique where you won’t have to use a lot tape just to wrap a gift as well.. Printable, can you share your tape-less idea? I use fabric napkins and either gather them up for re use or let them go to a new home as part of the present. I mostly use knots to secure – there are some great Japanese sites for using fabric wrap. Great post. I liked the idea of buying ReGreet cards where our recipients can resend our card to someone else. This would help in saving lot of paper and in turn lot of trees. Transform bits of paper and waste in the beautiful holiday card making paper. Delivery: Bits of scrap paper, wrapping paper, recycled paper, newspapers, magazines, etc.